Puzzled by Inequality? Us, Too. The mighty Malala Yousafazi said, "One child, one teacher, one book, one pen can change the world." We think one puzzle can, too. 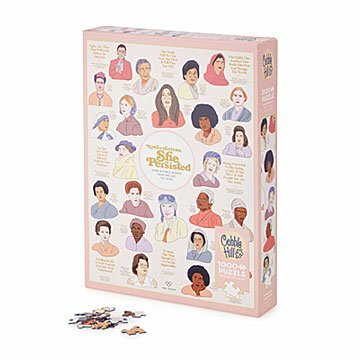 Put together this beautifully illustrated 1,000-piece design to see a powerful collage: 24 of history's most empowering, game-changing women. Throughout the board there are compelling quotes from icons like Amelia Earhart and Ruth Bader Ginsberg. It's an inspiring reminder of how far we've come and how far we have to go. Take it from Gloria Steinem: "The truth will set you free, but first it will piss you off." Made from 85% recycled paper in Indiana. Such a great gift for the feminist in your life. I purchased the puzzle for a friend. She immediately opened the package and started the puzzle right away. She also enjoyed the print that came with it and is planning to have it framed. I knew the second I saw this puzzle that I would have to purchase it for a fun family activity! It was an instant hit from the minute they saw it. Such a fun a well thought out concept! What a great, uncommon idea for a puzzle! We will do this puzzle as a group. My students are going to love working on this puzzle in the library! It's engaging and educational and sure to prompt some incredible curiosity and conversation.